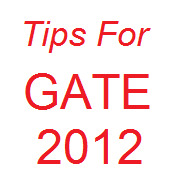 Gate 2012 exam will be held in February second Sunday. So all the GATE aspirants now should be serious about study . Every one has first priority to go a good IIT (Indian Institute of Technology ) for M Tech. Many students across the India and aboard the India preparing seriously and working hard to crack IIT. Many of iit aspirants taking coaching at good coaching centers in India. Now the time to achieve your aim. As a IITian I am suggesting you some tips which will help you achieve your goal. Make a strict schedule to complete your revision study. Don’t read any new topic if you face difficulties in understanding because gate is fully objective and all four options in a question will appear nearly same but there are little difference among them . If you don’t have deep knowledge in any topic then you cant understand the questions or options correctly.It is not subjective questions where if you answer the question and some part is correct then you will get some marks by step marking process. Gate answers sheets will check by machine and if option is wrong then you will get negative mark. Practice all formulas very well . Make own shortcut methods to solve problems but be sure your shortcut method always should be give correct results otherwise you should not apply this. Don’t be negative , because it will reduce your effort. Faith on God and your labor . Also with out a plan making labor is a valueless work. So proper plan yourself to how can you get good score in GATE. Make a strong determination that you can achieve this any how. Don’t discuss out of syllabus or any personal topic with friends except your gate topic because it will reduce your memory power, brain analysis power and may affect your determination towards gate. Only look all the difficulties topics and formulas very well. At night 9.00 pm stop reading and go to sleep with drinking sufficient water because sufficient sleep will increase your brains remembering power and analysis power. Just wake up at early morning at 6.00 am. Don’t read anything ,just think how exam will be going on. Don’t watch movie or don’t read any article or book. Prepare for exam and on the way of going to exam hall don’t read anything from advertisement hording. Don’t argue with any one and feel relax. Go to exam hall before 30 minutes . After getting the answer sheet(OMR) start the writing your roll no and name with pencil. Check two times if your information is correct or not. After getting the question paper start reading the all questions for 10 to 15 minutes .Divide your time to all question papers by mark wise before the examination day and reserve 15 minutes for question reading, 15 minutes for complete darkening(otherwise machine can not identify the answer) and 15 minuets for rechecking and remaining 2hrs 15 minutes divide to 60 (because 60 questions). At the time of reading the question paper on examination hall put a mark on question which you can solve 100% correctly and put a separate mark which questions you don’t know any thing. Try to solve the questions which you can answer with full confidence. Try to solve a question in its limit time. Limit time you already decide on above by dividing the total time with total questions. Don’t leave a question if it already partially solved and can be solve after giving more one or 2 minutes. Solve all the questions which you can answer with full confidence in a priority basis i.e solve all the linked questions first then common data questions then 2 mark questions then 1 mark questions and put a short mark for full solved questions and half solved questions and don’t know questions because it will save your time to identify the questions which you solved or cant be solve or already partially solved. Before 30 minutes of exam over just start to darken the circles in answer sheet. Don’t darken the answer sheet after solve question immediately one by one because it will take more time to darken. Also don’t darken the answers sheet by looking questions serial no. because if you make a single mistake to darken a single questions answer then all answers followed by that will be wrong . After all ,solve any remained questions which you faced difficulties leaved with partially solved. But before 5 minute of exam finish must be darken all answers which you solved. Good luck.